And a slightly scary experiment to try and fix it. This June, we published a big story—Shane Bauer’s account of his four-month stint as a guard in a private prison. That’s “big,” as in XXL: 35,000 words long, or 5 to 10 times the length of a typical feature, plus charts, graphs, and companion pieces, not to mention six videos and a radio documentary. That’s a great sentiment, and we agree! But it also takes us to a deeper story about journalism and today’s media landscape. It starts with this: The most important ingredient in investigative reporting is not brilliance, writing flair, or deep familiarity with the subject (though those all help). It’s something much simpler—time. Journalism often involves parachuting into a subject. We jump in, we learn as much as we can really fast, and we pass that on to our readers. That’s why journalists rely so much on quotes: We’re not usually experts at what we’re covering, so our job is to ask the right questions of the people who are. But this kind of reporting doesn’t get you far when experts are biased, have vested interests (e.g., virtually anyone in politics), or simply don’t exist. On those kinds of stories, reporters do have to build up their own expertise. They need to immerse themselves in a topic, long enough for the accretion of detail to morph into insight. There was a point when that kind of long game was a part, to some degree, of every newsroom. Reporters had beats so they could learn about an institution or a community over time. The good ones would accumulate a body of knowledge, and a b.s. detector to cut through the spin. The lucky ones would get to dive deep, chase a big lead, and spend months on a project. Sure, this was the exception, not the rule. But it was something news organizations knew they had to do to earn the public trust that would let them stay in business. That started to change in the 1990s, when merger mania sucked many independently owned newspapers and TV stations into publicly traded corporations, with the resulting pressures to deliver big returns for shareholders. It kept going in the 2000s, when digital advertising sucked the profits out of news, and it got worse as hedge funds and private equity investors wrung extra “efficiencies” out of already diminished newsrooms. And it continues today, with venture capitalists and billionaire power players the latest to seek a payday—or political influence—by reshaping media in their image. Stories that truly reveal something about the way power works are not going to happen in this framework. They take time (way more time than can be justified economically) and stability. They take reporters and editors who can trust their jobs will be there, even if money is tight or powerful folks are offended. They are driven by a desire for journalism to have impact, not just turn a profit. Take our prison story. Shane started writing about criminal justice for Mother Jones four years ago, after he returned from being held hostage in Iran. (Let that sink in—how he used that horrible experience to help the rest of us understand what prison really is.) His first big piece, in 2012, was the result of spending several months investigating solitary confinement. Shortly afterward, he came on board as a staff reporter. That’s important: MoJo used to be a magazine written mostly by freelancers, but in recent years we’ve prioritized hiring full-time journalists, with the wraparound support of a real newsroom. This stability and support is what made every one of our breakthrough investigations possible. It let our Washington bureau chief, David Corn, do the months of dogged reporting on Mitt Romney’s economic record that led to the 47 percent scoop in 2012. It enabled Josh Harkinson to dig into Trump’s white-supremacist fan base and discover the avowed racists among his delegates earlier this year. And it’s what has allowed us to do four years of in-depth reporting on mass shootings and the gun industry, investigations that have helped change the nature of that debate. Conservatively, our prison story cost roughly $350,000. The banner ads that appeared in it brought in $5,000, give or take. MoJo did have support from three foundations for our criminal justice reporting. That’s amazing—but foundation grants only go so far. They are typically limited in time (a few years, tops) and scope (focusing on a particular issue or initiative). And they are finite: All of our foundation support put together accounts for roughly 15 percent of MoJo’s annual revenue. How else, then, to pay for this kind of work? If you’ve been reading our stuff for a while, you know what we believe the answer must be: support from readers. It makes up 70 percent of MoJo’s budget, and it’s what has kept us independent, strong, and able to withstand the pressure (including lawsuits from billionaires) to let go of controversial stories. And based on your response to Shane’s piece, a lot of you totally get it. But in order to really keep investing in the long game, we—and, we hope, you—will have to do something different. We’ve talked about how fickle ad revenue is. But fundraising is pretty boom-and-bust too. Typically, nonprofits like us run big pledge drives that seek, frankly, to scare you into giving—”donate right now, or this VERY BAD THING will happen!” It’s not an approach that respects your intelligence, it makes for a bad user experience (lots of emails and online ads), and it doesn’t really match up with the work you want us to do. Because that work is not something you can do in fits and starts. It’s not about responding to an immediate crisis (or for that matter seizing a short-term opportunity—let’s hire a bunch of people and fire them in six months). The real work is about putting reporters on the beat, day after day, month after month. So starting now, we’re undertaking a new experiment—scary, but exciting—in how we pay for MoJo’s journalism. And we’ll try to make the case with facts and logic (just like our journalism), not sensationalism and panic. Here’s the bottom line: If you want us to play the long game, the most powerful thing you can do is to do the same. In other words, become a sustaining donor with a tax-deductible gift that renews every month. We don’t have an endowment or reserve fund sitting around somewhere, or advertising profits we can squirrel away. Support from you is the only reason we can do the work. If you join us as a sustaining donor, you’ll be part of making the next prison project, the next gun violence investigation, the next 47 percent story happen. You’ll keep reporters on the beat, fact-checking those in power. If that sounds right, you can start your monthly support here. But if you’re the kind of person who likes to nerd out on the mechanics—or really wants a look at the books before deciding to invest—let’s break it down some more. In the past, our three big fundraising pledge drives typically raised between $125,000 and $200,000 each. Last year, we did better: Readers dug deep and gave $260,000 to help us pay down the legal bills we faced after winning a lawsuit from a billionaire political donor. Then you rose to the challenge again in December and April, pitching in a combined $415,000. And in the month since Shane’s piece published, we’ve had an extra spike in donations and subscriptions. But banking on raising money in these kinds of fits and starts is a huge risk—and there are clear limits to how much of it we think we can do without being incredibly pushy with emails and ads on the site. Plus there’s little room to grow—and grow, at a time of crisis in both journalism and our politics, we must. If 0.02 percent of the people who visit the site by the end of September sign up as sustainers, we will have proven something really important about how to keep in-depth journalism alive. Here’s the other approach. If, before the end of our next scheduled pledge drive in September, we can find just 2,000 readers who value our reporting enough to each pitch in $15 a month, we’ll generate $30,000 in new monthly revenue, or $360,000 over the course of the next 12 months. That’s enough to fund a big project like Shane’s—every single year. And we hope we can get there largely with the argument you’re reading right now, instead of blanketing the site with fundraising ads or filling your inbox with panicky emails. Is that a fantasy? Well, right now, hundreds of thousands of people are sustaining donors to public radio and television. At MoJo, we currently have about 2,000 sustainers who give about $28,000 a month. But there are some 185,000 of you who subscribe to the magazine, 250,000 who subscribe to our email newsletters, 1.2 million who follow us on Facebook or Twitter, and between 9 million and 10 million of you who come to our website every month. If 0.02 percent of the people who visit the site by the end of September sign up as sustainers, we’ll meet our goal. We have no idea if it will work—and if it doesn’t, we’ll have to pull out all the stops to figure out something else—but everything we know says it’s the right way to go. And if it does work, we will have proven something really important about how to keep in-depth journalism alive. Are you in? Start your tax-deductible, monthly gift today. We promised no panic or sensationalism, and we’ll stick with that. But we can’t overstate how urgent this is: Reliable, monthly contributions represent our best shot—and, we believe, your best shot—at ensuring a stable foundation for the watchdog reporting our democracy desperately needs. If you join in, you’ll be part of a big experiment that others can emulate: As you’ve seen with our previous posts on the business of media, we’re committed to transparency and sharing what we learn with our peers. So let’s see if we can do this thing. We’ll keep you updated here, and we’d love your thoughts on whether this is the right direction and how to refine our approach. Let us know in the comments, on Twitter and Facebook, or at fundraisingteam@motherjones.com. That prompted a lot of people to sign up as sustainers—nearly 600 that Thursday and Friday alone. Altogether, those 1,061 new monthly donors have given $11,792—which will renew month after month, to keep our reporting going strong in the long term. That puts us more than one-third of the way to our goal of $30,000 in new monthly revenue—after just over a week of a planned six-week effort. And it means we may be able to wrap up this drive early, and avoid blanketing the site with ads or hitting your inbox with a lot emails over the next five weeks. But that can only happen if more readers sign up. One thing we’ve learned from the project so far: We’d aimed for an average $15 monthly gift, based on the data we have on a small number of monthly donors (mostly from our print subsciber community). But the average for this new push is coming in at $11.11—our theory is that people who wouldn’t have given in the past have given are now signing up, which is great. 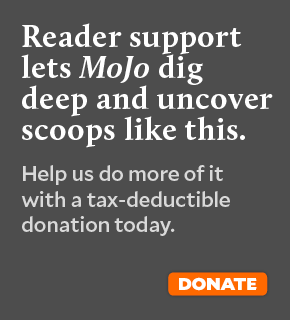 If the average gift stays at $11, we’ll need about 1,600 more readers to invest in MoJo on a monthly basis. But if we can get back up to the $15 amount from here on out, it’s roughly 1,200 new sign-ups to hit our $30,000 target. So if you’re reading this far down, we hope you’ll decide to join the team and become a monthly donor today. Let’s get this done! And a big thanks to everyone who’s already pitched in—we promise to put your generosity to work producing the hard-hitting stories you expect from us. Update, 9/1/2016. Now comes news that the Department of Homeland Security (DHS) will reexamine its use of private prison companies to hold immigration detainees. This is a BFD—nearly three-quarters of immigration detainees are held in privately-run facilities. Closer to home, I’m also blown away by the response to our push to change how this kind of investigative reporting is paid for. We’re halfway to our goal of $30,000: 1,329 readers have joined us in donating $14,687 in new monthly gifts. That’s amazing—thanks so much, every one of you—and it allows is to actually dream of wrapping this campaign up ahead of its scheduled end, in late September. That would be incredible, because typically—or so the fundraising pros tell us—up to 50 percent of the revenue from a fundraising drive like this comes in during the final ten days, when a looming deadline drives urgency. We’d really like to avoid that “OMG we’re not meeting our goal!” moment. But we can only wrap things up if readers like you this post for the highlights. Update, 9/15/2016. The good news first: We’re up to 1,578 new sustaining donors who have made a total of $18,049 in monthly pledges to support our reporting. That’s pretty amazing, especially considering that in MoJo’s 40 years to this point, we’d only accumulated 2,000 monthly donors! And here’s another nice trend—folks who have given in September are averaging $13.37, compared to the August average of $11.10 (hooray Team September) and we’ve even had a handful of super generous folks pitch in $100-plus on a monthly basis. But our dream of winding the campaign down early doesn’t look to be coming true. We’re getting right around 10 new people each day to sign up, which is great, but won’t get us to our $30,000 goal by the end of the month—and like we’ve talked about before, that figure isn’t some arbitrary number or a “nice to have.” It’s the actual amount we’ve got to hit to make our budget and keep reporters on the beat. What will get us there? We’re working on a new appeal that we hope will help us make the case to folks who haven’t given before. And we’ll probably run a batch of ads on the site next week, to get the message out to those who’ve missed this drive entirely. It would be a huge help if you Update, 9/29/2016. We are SO close… and now we need your help to get across the finish line. In all, since we launched this experiment, 2,129 readers have signed up as sustainers, committing to a total of $25,159 in monthly pledges—an average pledge of $11.83. It only takes about 400 more, at that same average pledge, to get to our goal of $30,000 in monthly revenue, which will be enough to support a powerful investigation like the one on private prisons every single year. It’s a nail biter to do this in the last couple of days of this campaign, but we believe we—that is, you—can do it. We’re going to work hard spreading the word the next couple of days. But your help is critical, because you can reach people who aren’t already in our universe, or who are still on the fence. If you can’t pitch in right now (and we totally understand), you can help a lot by sharing this appeal with your friends and encouraging them to join our experiment. And if you did sign up, let your friends know that you did is a powerful motivator! The political landscape is making the need to fight spin and b.s., and to ramp up truthful reporting very obvious right now. It’s the right time to invest in putting this kind of journalism on a stable footing, and together we can do it.